Chinese Ministry of Finance announced on June 13th that it will issue 14 billion RMB and 2 billion USD sovereign bonds this year in Hong Kong, marking the first issuance of dollar-denominated sovereign bonds after 2004. Major financial publications (including WSJ and FT) have reported this week that the country might launch the issuance as soon as September. We believe that this issuance is to take advantage of the low interest rates and a booming dollar market. According to Deralogic, deals denominated in the US currency have raised $354bn across the Asia Pacific region this year. But what makes this issue more significant compared to other [smaller] economies of the Asia Pacific is the size of the Chinese economy. As discussed later in this article, this is a unique case because large economies with developed domestic consumer appetite prefer to issue bonds in their domestic currency rather than foreign currency to mitigate their foreign currency exposure. According to an IMF report, China’s biggest set of lenders is its State Owned Enterprises (SOEs). China’s central bank is said to be encouraging banks to issue more US dollar bonds at a time of steep declines in the country’s foreign reserves, raising supply prospects for the sector and decreasing borrowing costs. These lower borrowing costs can directly be transferred to corporate clients via loans. The dollar issuance will also offer Chinese investors an alternative to buying wholly foreign securities. It is beneficial for the system since most of the state banks are better known in the international markets and can finance debt at lower costs compared to SOEs. It is expected that if China issued 10-year bonds, the premium could be 65bp over the US Treasury rates implying an effective interest of between 2.27 and 2.84 per cent. One might argue about the significance of a $2bn bond issue in a market worth more than $9 trillion (according to the Bank of International Settlements). It is necessary to note that this bond issue comes at a time when investors demand more transparency in the Chinese financial markets. A 10-year dollar denominated bond issue might be useful to create a dollar yield curve for Chinese debt issuers. Corporations can use it as a benchmark to gauge the appropriate interest rate when they sell debt. The dollar denominated debt can also be seen as an opportunity to curb dollar outflows from the economy. The PBoC guidance follows a drop in China’s foreign reserves of nearly $320 billion to $3.011 trillion last year on top of a record fall of $513 billion in 2015. With $195 billion of dollar debt maturing over the next three years and risk of a regulatory crackdown on wealth management products and a strengthening yuan, Chinese investors have started to load on dollar assets. This issue provides a way to satisfy investor concerns while keeping the money in the Chinese economy. The Chinese government has been issuing offshore RMB bonds for nine consecutive years in Hong Kong and the amount has always been 28 billion in the past three years. The amounts raised this time are consistent with previous issuances. The interesting question, then, is why the government has decided to return to the dollar denominated sovereign debt market now. China has issued dollar debts 12 times with total amounts of 6.7 billion USD; where 10y bonds make up 69% of the total issuance (Table 1). The main purpose was to increase foreign exchange holdings at early stages of its open-up policy. However, since it joined WTO, China experienced fast trade surplus growth and accumulated huge dollar reserves eliminating the need for further issuance of dollar debt. China then announced the new exchange rate policy in 2005 to allow RMB to float against a basket of currencies (under the management of its central bank). As a result, Chinese yuan appreciated more than 20% until the financial crisis and huge amounts of money flowed into the economy. Based on Bloomberg data, China has a total of 12.3 trillion yuan of bonds outstanding. The new issuance will bring the outstanding dollar bonds to 2.2 billion USD, which would still consist very small portion (0.11%) of the total debt. Given all the factors above, we can safely conclude that the issuance is dictated by qualitative factors and not many quantitative factors. We think there are four major reasons for choosing to issue dollar bonds now. Moody’s downgraded China’s credit rating to A1 from Aa3 in May due to concerns over slowing economic growth and longstanding debt problem. The Chinese government might want a successful issuance to restore foreign investor confidence before the anticipated 19th National Congress in October. China launched the so-called Bond Connect on July 3rd to allow foreign investors access Chinese bond markets without setting up onshore accounts. The government rushing to announce the news of dollar bond before the open of Bond Connect could also be a sign to comfort investors. Although dollar sovereign debt instruments have not been used for a decade, corporates and financial institutions have been issuing dollar bonds over the years. 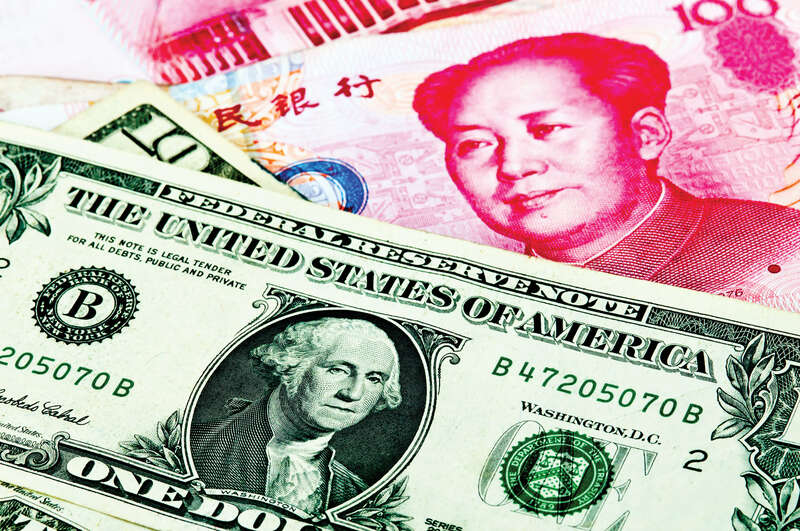 This issuance will set the reference price for all other dollar bond issuances after the Moody downgrade, especially when many Chinese corporates faced difficulties in pursuing dollar denominated bonds this year. Raised funds can be used to finance overseas acquisitions and projects under One Belt One Road initiative. Capital controls seem to loosen recently and foreign reserves are back to $3 trillion again. The Chinese government may allow state-owned companies to resume overseas deals. In short, this issuance is more about price discovery and testing the market. Arguments made in conjunction with research papers published by European Central Bank (Maurizio Michael Habib and Mark Joy) and World Bank (Stijn Claessens, Daniela Klingebiel, and Sergio Schmukler) can clarify the various institutional factors that could define Chinese bond policy over the next ten years and some of the risks that investors will have to hedge. As mentioned earlier, the bonds could provide a way to suffice domestic investors’ appetite for dollar assets and prevent capital from fleeing the economy. From the investors’ point of view, an exchange rate risk arises with yuan appreciation. Investors can lock in the interest rates by entering into offsetting contracts and hedging their risks through financial products such as currency forwards, currency futures, or currency options. We feel that it is essential for investors to learn what factors guide policy decisions so that they can adequately purchase and balance their portfolio. All else being equal, issuers seem to prefer to borrow in currencies that are associated with lower nominal interest rates and issuance is not, on aggregate, linked to the appreciation of the issuance currency. This could possibly explain the conundrum that arises given the recent weakening of the dollar. While the $2bn issue is trivial compared to the Chinese market as whole, it could be the start of a policy that could provide a ‘natural hedge’ against the dollar denominated inflows that take place in the country due to exports. According to a European Central Bank paper, for 5-year and 10-year maturity bonds, a 50-basis-point increase in uncovered borrowing-cost savings is associated with an increase in the currency share of issuance of around 1 percentage point. This lies in line with the current market conditions and gives a reason for the dollar-denominated bond issuance in more than a decade (Chinese bond yield on a 10-year bond was 3.609% at the time of publishing). In order to determine the sustainability of the policy, investors must also observe institutional factors that determine the issuance of bonds (in domestic and foreign currency). According to a background paper published by the World Bank, less flexible exchange rate regimes lead to more foreign currency issuance. This is consistent with our current case since countries borrow more in foreign currency to signal their commitment to a fixed exchange rate regime as well as with the view that moral hazard motivates foreign currency borrowings. This dollar issuance announcement comes at a time when investors are perplexed by the strengthening yuan and might help mitigate the volatility. The paper is consistent with the Chinese goal of keeping its exchange rate in a fixed band. Issuance of dollar-denominated bonds will help boost investor confidence in the fixed rate policy. Viewed from another side, it can be said that bond investors from countries with more flexible exchange rate regimes will be less fearful of sharp depreciations of their currency and of large inflation spikes that can decrease the real value of their investments. The study points out that economies with deep consumer bases for bond markets prefer to issue debt in their local currency and China is one such country. However, an argument for the dollar denominated bond issue is that, given the recent dip in foreign exchange reserves, this issuance can a policy experiment to mitigate future foreign exchange risks and a policy to curb dollar assets appetite of the Chinese investors. First issue faced by investors is the pricing of this issuance. Since details haven’t been published yet, we will try to estimate the fair prices of the bonds. Here we would only take 10y bonds as an example. Based on Table 1, the historical weighted average spread for 10y dollar bonds is 132bps. However, current economic and interest rates environment has changed dramatically in China compared to thirteen years ago and we must find other ways to figure out the potential price. One way is to look through the ratings. Based on Damodaran’s data, default spread for Moody’s rating of A1 is 74bps. There are two potential issues on applying this method. Firstly, default spread is calculated as an average estimation for the same rating class and while five other countries share the same rating (Czech Republic, Estonia, Israel, Japan and Saudi Arabia), only Japan has similar economic and geographic condition. Secondly, Moody’s rating is based on local currencies and ignores currency risks. To include currency and capital control risk, the spread would be higher than 74bps. As a result, we must adopt another method of using sovereign CDS spread. Default spread can be calculated as the difference between the country’s CDS spread and US CDS spread, adjusted in USD terms. In this way, we get the 10y spreads for China, South Korea and Japan as 93 bps, 39bps and 15bps respectively. Considering the 10y spread for outstanding Israel and Japan dollar bonds are both around 60 bps (for Japan we calculate the basis of dollar-yen basis swap to estimate the spread, as shown in Graph 1), we believe the pricing will be lower than 93 bps and lie in the range of 70-80 bps vs. 10y Treasury which is currently at 2.2%. It’s worth noting that demand will also play a significant role in pricing. The China-backed institutions in Hong Kong will surely bid aggressively on the issuance which may push down the final premium. If the issuance is successful, investors will be more comfortable to hold Chinese assets, including stocks. CNY has appreciated 3.7% against USD and Shanghai Composite climbed 6.3% after June 13th. We think the benefited sector will be financial sector, especially banks. A low premium offering will show market confidence in the credit quality of China and controllability of debt problem. The 5th National Finance Conference held in July also addressed enhancing systematic risk management of banks. Bank of China (601988.SH and 03988.HK) and ICBC (601398.SH and 01398.HK) are worth paying special attentions on. Both stocks can be traded through the Stock Connect and dual listed in Hong Kong and Shanghai. Based on our findings, we must say that this issuance is more symbolic and represents a change in the Chinese policy towards issuance of debt. The Chinese government is desperately trying to clamp capital flowing out of the country and a successful issuance could be the gateway to mitigate volatility of the Chinese yuan (through similar future issuances) and fulfil domestic investor appetite of loading on foreign assets. This issuance would also help formulate the Chinese financial markets to a greater extent by providing dollar yield curves, help corporations to finance debt at more efficient rates and reinstate confidence in debt markets.